Welcome To Our Family Adventure! Hi! We are the Amaya family. We love road trips. We are exploring Arizona and neighboring places. When you think of Arizona, you’ll probably think of desert, cactus, and hot weather! However, Arizona offers many pristine Lakes and magnificent mountain views. Checkout more of my blogpost of the places that we’ve visited here in Arizona. It is one of the most interesting place to visit in the USA. If you’ve never considered an Arizona road trip or vacation, now is the time to rethink your next trip. There’s a lot to see and beautiful places to visit in Arizona. Apache Junction is a place in Arizona that is not familiar to me. I am sure most of you knew Grand Canyon, Sedona or Phoenix if someone mention or ask about Arizona. I am very grateful for having a chance in life to see and explore these wonderful places and share it to you. Apache Junction is a home to the majestic Superstition Mountains. It is located about forty miles east of downtown Phoenix and more than an hour to drive from Anthem Arizona where we live. Many tourists and locals enjoy the activities like camping, hiking, golf, horseback riding and water sports. 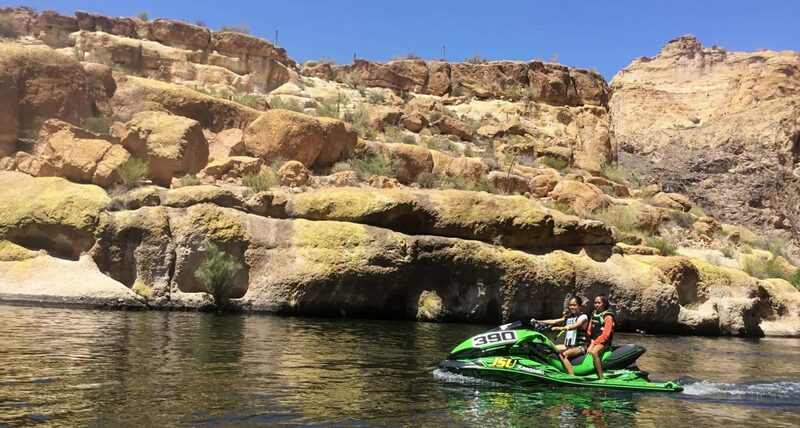 Our first visit to Apache Junction was just for jet skiing at Canyon Lake. We drove from Anthem Arizona to Canyon Lake. As we are approaching Apache Junction, I love the wonderful scenery. Superstition Mountain has such an amazing view. Canyon lake is one of the many beautiful lakes here in Arizona located in Apache Junction, Arizona. As we drove to Canyon Lake, I’ve noticed the gold color rocks formation. Indeed! Arizona is not just about desert but this place is blessed with many beautiful scenic view. We had a blast riding our Kawasaki jet ski and enjoying the water. I’m so glad that my daughter loves riding the jet ski and never felt scared. We’ve been to many lakes here in Arizona, but Canyon lake is such a great place to visit and hang out with family and friends. The scenic view, the colors of the Canyon is so amazing. There are many areas in Canyon Lake for picnic, boating, jet skiing, camping, kayaking and more with stunning scenery. But I love the Marina and Campground. They have everything you need to enjoy your stay at Canyon Lake. If you don’t have your own jet ski, they have boat for rent to explore the Canyon Lake or you can ride on a Dolly Steam Boat and cruise the salt river. If you love camping, they have campsite and RV site too. After 2 hours of enjoying the water and jet skiing at salt river, we dine in at their lakeside restaurant. They have a great menu and the staff are incredibly friendly. It was my daughter’s birthday, so they gave us a free ice cream. Such a memorable day for us. As we drove back to Anthem Arizona, we stopped at Goldfield Ghost Town. There are many things to do here. We enjoyed the exhibits of the history of the place. You can also try their zip line, ride the train, Gold Mine Tour, or Apache trail tours. We would definitely go back to try all their activities. We don’t have enough time to explore since it’s only one day trip. Thanks for reading! Until next road trip! I would love to visit Arizona just to go jet skiing. I must commend you on the beautiful pictures it makes me feel as though I was there. What a lovely place! I love that it is not packed with hoards of tourists. The lake and the weather was perfect for jet-skiing! Thanks for sharing your wonderful photos! Just breathtaking! Loved the pictures and would want to visit Arizona Apache Junction when ever we can.. soon though! Wondering why “Superstition Mountains” are called so? Interesting name for mountains. I love the photos! And the gold town would be so interesting, love the old saloon. So many fantastic places to visit here! I’ve always wanted to visit a ghost town and GoldField looks really entertaining. The Gold Mine tour sounds really interesting – I’ve always seen those mentioned in books and movies. Your pictures are amazing. Never thought Arizona is such a beautiful place. I would love to go one day. This looks interesting though I bet it gets really hot! The ghost town looks like out of movie, seriously cool! I love water. Wherever there’s water there’s me. I like Arizona for many personal reasons. I liked your writing and the pictures are amazing. What beautiful landscapes! I would very much like to visit Canyon Lake and Arizona at least once. I’m sure you enjoyed it! It looks like you had such a great time exploring here. Your pictures are so lovely and it looks like you had some superb weather! Wow, that certainly looks like such an incredible place to visit. Arizona is a place in the US that has always interested me, I hope to visit one day. Makes me want to go back to Arizona. Although I think I would rather do it in the fall when there is less heat out there. But it looks so cool. And the ghost town looks like a lot of fun. Arizona looks absolutely stunning. I would love to visit and see the desert. Jet Skiing looked fun too! I am so proud of you Ate! You are a pro now! Nice trip! I am sure you guys had fun.